Features: Adjustable beam, Self-rotating head, and Fixed position. 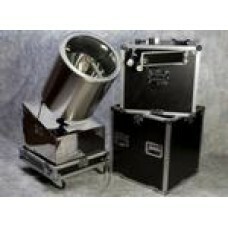 The searchlight plugs into a standard 20 amp or 30 amp 120 volt power outlet. Comes with a 30 amp to 20 amp adapter, and an Industrial grade storage/shipping case.